Prisoners are being allowed to smoke e-cigarettes as part of a pilot scheme that could lead to a jail smoking ban. BBC News has learned that a brand of disposable e-cigarettes has been on sale in three prisons for two months. The Prison Service said last year it was committed to introducing a smoking ban across the prison estate in England and Wales to reduce health risks. A spokesman said it was looking into whether disposable e-cigarettes were suitable for use in prisons. The e-cigarette brand, Bull, is available in prison shops in the women's jail Eastwood Park in Gloucestershire and the men's prisons Preston in Lancashire and Stocken in Rutland. It is understood about 50 were bought in the men's prisons in the first week and weekly sales are now in single figures. A ban is also being proposed because of legal action taken by prison officers and inmates who have complained about the effects of passive smoking. 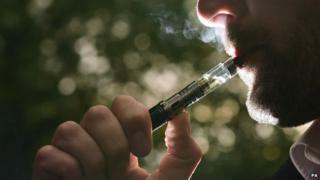 Officials at the National Offender Management Service (Noms), which runs prisons, started the e-cigarette scheme as a way of preparing the ground for what they acknowledge would be a "major change". An estimated 80% of prisoners currently smoke; which is allowed in prison cells but not in other parts of jails including exercise yards. Noms is believed to have been impressed with the implementation of a smoking ban in Guernsey's Les Nicolles prison which came into effect last year. But no date has been set for the ban to be introduced in England and Wales. A Prison Service spokesman said: "We are looking into whether disposable e-cigarettes are suitable for use in prisons and are currently conducting a trial in three prisons." The Prison Officers' Association (POA) began campaigning for a smoking ban in all UK prisons in 2007. The POA had expressed concerns about staff and prisoners "forced to suffer the harmful effects of second-hand smoke". It came after smoking bans were introduced across the UK, to protect people from the effects of second-hand smoke in workplaces and enclosed public spaces. A ban came into effect in England in July 2007 following similar legislation in Scotland, Wales and Northern Ireland. The bans did not apply to prisoners as their cells were defined as "domestic premises", although non-smoking prisoners could not be made to share a cell with a smoker. Guernsey and the Isle of Man were the first two European jurisdictions to introduce a blanket smoking ban in prison grounds. A spokesman for the Prison Governors Association said "anything that could protect not only staff but other prisoners and visitors from second-hand smoke inhalation is obviously welcomed. "We will be watching this trial with interest to see just how successful it is."